This family owned and operated business is situated just West of Nabiac on the beautiful Wallamba River. Agland Turf Supplies has been proudly servicing the Mid-North Coast region since 1980. 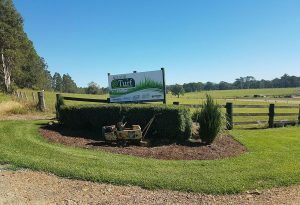 We supply turf to all areas from Coffs Harbour, Port Macquarie, Wauchope, Kempsey, Taree, Forster, Port Stephens, Tea Gardens, Hawks Nest, Maitland, Raymond Terrace and Newcastle. Combined with the best service and advice and a large variety of turf on the Mid North Coast, we can cater to commercial and residential clients alike. We will have the lawn to suit you. Call us on (02) 6550 2126 to see how we can help you. We service as far North as Coffs Harbour and we go as far South as Newcastle.